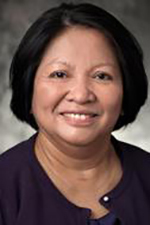 Profile: Certified by the American Board of Family Medicine, Dr. Myrna Patricio is a dedicated and diligent family physician caring for the needs of patients from infants to seniors and every age in between. She strives to ensure every patient receives the care they deserve. Dr. Patricio is skilled at building close relationships with her patients and takes the time to listen to each patient’s health concerns and work on their treatment accordingly. She is extremely passionate about her work and receives satisfaction from the fact that her patients feel comfortable and confident when they come to visit her.